Sarah joined me and some of my friends from Wednesday Night Trivia for a red-eye trip on the Fun Bus to the Windy City. Altogether there were eight of us; Jenny, Bob, Pattie Jo, Brenda, Linda, Sharon, Sarah and I. We loaded onto the Fun Bus late last night and traveled all evening to arrive in downtown Chicago this morning at 8:30. We started on foot on Michigan Avenue at the visitor center near the Water Tower. We headed to the nearest subway station. Once there, the first thing we saw was a transit vending machine that was out of order. Suddenly, Sarah, Jenny and I had flashbacks of our trip to Washington D.C. Then we learned that the all-day passes we needed weren't sold in subway stations at all. We had to walk back up to street level and walk another block to buy them from a check cashing business. Yeah, that's convenient. Our full day passes were $5.75 each. Soon we were on the subway and off to Wrigley Field. 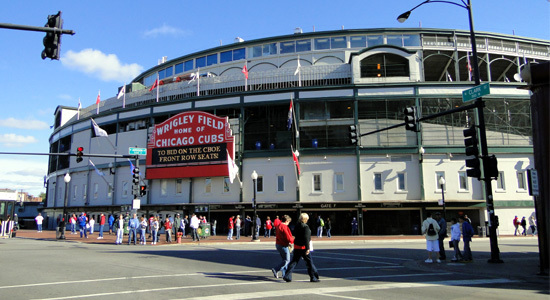 Click here to see my photos of Wrigley Field. When we arrived along Addison St. the Cub fans had already begun to arrive for the noon game against the St. Louis Cardinals. We walk a couple of the streets surrounding the stadium. We saw the rooftop bleachers along West Waveland Avenue and North Sheffield Avenue. We also checked out the taverns and souvenir shops along Addison and Clark Streets. Next we rode a train back to Downtown Chicago to see Willis Tower. 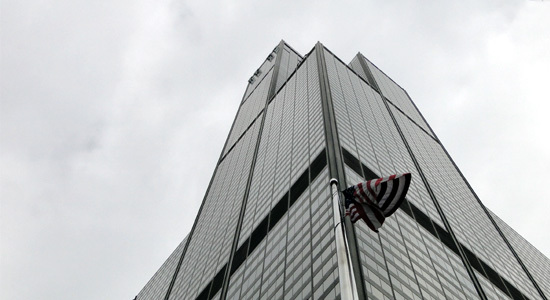 Click here to check out my pictures of Willis Tower. Our tickets to the Willis Tower Skydeck were $15.95 each. The high overcast skies didn't interfer with our sightseeing from 1,353 feet. For the most part I wasn't too anxious about my fear of heights while we walked around the skydeck and took pictures. I did get nervous when I would get real close to the glass or have to lean towards the windows to get my pictures. Several people asked if I would take their pictures with their cameras for them. The crowd worked it's way around the skydeck and arrive on the west side of the building where "the ledge" was located. The ledge is four newly installed glass boxes that extend out four feet on the outside of the building. The walls, ceiling and floor are all glass. Jenny and Sarah didn't have any hesitation about getting out on the ledge. I stayed just outside the ledge on the solid floor of the skydeck while I took pictures of those that were less fearful than I. There was even a brief moment when I was even scared for Sarah. There was quite a crowd of people jockeying for position. I did try for a moment to go out onto the glass, but I was only able to force myself out a couple of inches. I think if there would have been less of a crowd there and I had more time to build up my nerve I may have been able to step out for a brief moment. I would love to have gotten my picture taken on the ledge. We then made the our way back down to street level for a few more pictures of Willis Tower before catching another train towards the Chicago River for a lunch and a boat tour. 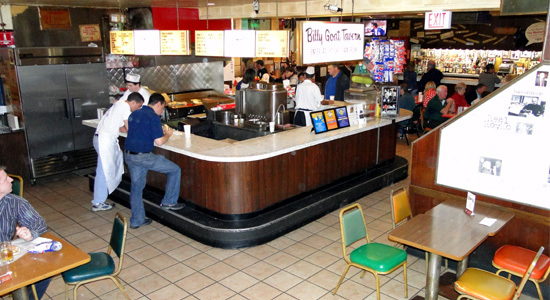 Click here to see all the photos of Billy Goat Tavern. We purchased our bout tickets but had over an hour to wait for the tour, so we decided to get some lunch. The lady at the boat tour directed us to the closed restaurant. It was the Billy Goat Tavern. Chicago has many multi-level streets and the restaurant is on the lower levels. It was a little hard to find, beneath the streets and hidden in the dark. As we approached I saw a sign that read "Cheezborger! Cheezborger! Cheezborger!" I thought to myself, could this be the place that was on Saturday Night Live back in the early days with Dan Aykroyd and John Belushi. My suspicions are confirmed once we were inside. We were greeted with a sign that read "Enter at your own risk". We quickly heard "Double Cheezborger? ", "Chips?" and "Coke?". Because of my memories of the Saturday Night Live skit I was able to instantly figure out what I was expected to do. So I quickly ordered meals for Sarah and myself. A few of the others weren't so lucky. Some asked for single burgers and were instantly told "Single thin, you want double, triple better." And those that ordered fries were of course told "No fries, chips". It was $16.44 for the two double cheeseburgers, two bags of chips and two cokes for Sarah and me. The restaurant was poorly lit and didn't appear to have been renovated in decades. The menu boards above the counter were old and yellowed. And the walls were covered with old photos and newspaper articles. It was quite the experience. I was loving it. Once we all finished our meal we walked back to the Chicago River for our boat tour. Click here to view the pictures from the Wendella Boat Tour. Our Wendella Boat Tour began on the Chicago River near Michigan Avenue and headed downriver through downtown. This first part of the tour highlighted the architecture of the city. 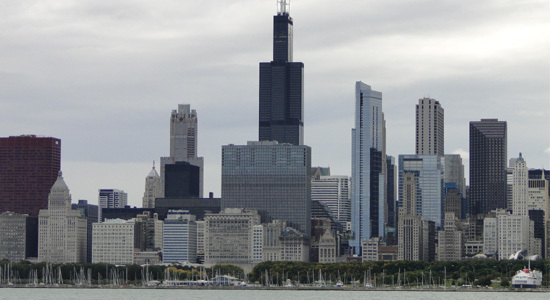 We were told about many of the buildings along our route downriver and back upriver again, including Trump International Hotel & Tower, Boeing Building, Merchandise Mart, Willis Tower, Civic Opera House and Wrigley Building. We traveled from the Chicago River through the Chicago Lock and onto Lake Michigan. We sailed past Navy Pier and turned north towards the John Hancock Building. Next the boat turned south and traveled past the Chicago Harbor Lighthouse and we could see Willis Tower, Adler Planetarium, Shedd Aquarium, Field Museum, Soldier Field, Grant Park and Buckingham Fountain. We took a ton of pictures of the skyline. Once we arrived back on Michigan Avenue we split into two groups. Linda, Sharon, Patty Jo and Brenda headed for the Magnificent Mile for some shopping, while Bob, Jenny, Sarah and I headed south to Millennium Park. Click here to check out my pictures of Cloud Gate. Our first stop in Millennium Park was Cloud Gate. The elliptical sculpture was forged of a seamless series of highly polished stainless steel plates. It reminded me of a huge drop of liquid mercury. There was a large crowd admiring the sculpture. I was very impressing with its beauty and shape. I couldn't stop touching it and taking pictures of the reflections off it's surface. We walked completely around the sculpture and through the twelve-foot arch at the middle to the concave center beneath it. 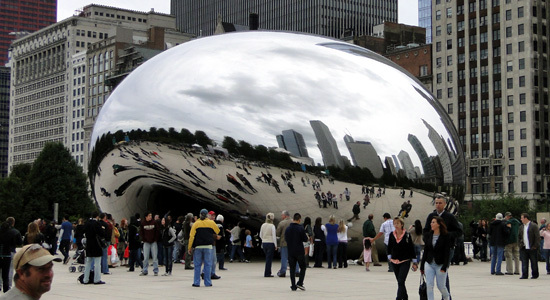 Cloud Gate is 33 feet high and 66 feet long. The next stop in Millennium Park was Crown Fountain just to the south. Click here to see my photos of Crown Fountain. The sun was starting to get lower in the sky as we walked around the Crown Fountain. The fountain consists of two 50-foot glass block towers at each end of a shallow reflecting pool. The sides of the towers that face each other project video images of Chicago citizens, a reference to the traditional use of gargoyles in fountains, where faces of mythological beings were sculpted with open mouths to allow water, a symbol of life, to flow out. Water flows down the remaining three sides of each tower. The reflecting pool is so shallow that I was able to walk on the water without the water soaking into my shoes. Jenny wasn't so lucky; the soles of her shoes weren't as thick as mine. It was starting to get late and we were ready to eat. We began walking north along Michigan Avenue. 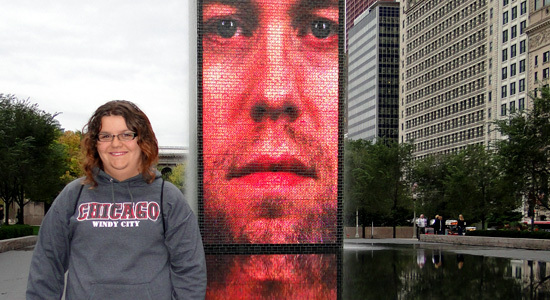 Jenny wanted to take Bob on a short side trip to Navy Pier. Bob had never been to the pier. Sarah was getting tied so I found a place to sit and waited with her while Jenny and Bob made their short trip. When Jenny and Bob returned the four of us made our long walk west to Ed Debevic's. 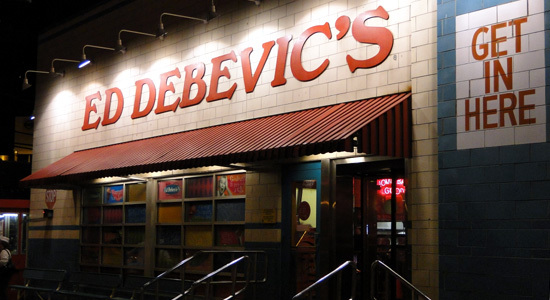 Click here to see all my pictures from Ed Debevic's. We arrived at the restaurant and put our names down for a table. Linda, Sharon, Patty Jo and Brenda arrived by taxi and soon we were seated. Our waitress, Lola introduced herself, said that she would be sassy and if we didn't like it that she really didn't care. I asked what kinds of beer they had, she recited them off me, I asked for Bud Light and Lola said "After all that, you order the crappiest beer in the world". Jenny reminded me of the Fat Tire sign we had seen earlier in the day. So the next time the waitress came by I asked for Fat Tire. She looked at me and just walked away. So I had no idea what she was going to bring me to drink. We were all having a good time, chatting and listening to the music playing. The restaurant had a retro 50's and 60's vibe. At a nearby table the waiter got refills for everyone's drink but made them walk to the service counter to pick them up. He yelled at them, "If you're thirsty, you'll come get 'em". We you drinks came to the table I got a Bud Light, but it was in an bottle shaped like a bowling pin. Soon our food arrived. I ordered the meatloaf, but I wasn't given any silverware. When our waitress came back around I motioned to her that I needed silverware. When Lola brought it to me she said that I should have gotten it myself from the service station right next to our table. We had all ordered a variety of food, including burgers, quesadilla, meatloaf and pizza. While we were eating we heard an announcement, "If you want refills on your drinks, you'll have to wait three minutes". The wait staff climbed on top of the counters and in the windows and began dancing. They put on quite a show. Everyone was enjoying it, laughing and taking pictures and video. We really had a great time at Ed Debevic's. The eight of us ate for $182, which included at $24 tip. Of all the possible restaurants we could have eaten at today in Chicago we managed to get two of the very best: The Billy Goat Tavern and Ed Debevic's. I'm really glad we hit these two spots. We left the restaurant and loaded into two taxis for a high-speed slalom ride through back to the visitor center on Michigan Avenue that would have made Dale Earnhardt proud. During our last few minutes in Chicago, while we were waiting for the bus, we did some browsing in the Hershey Chocolate Store and Ghirardelli Ice Cream and Chocolate Shop. The Fun Bus arrived and we all quickly boarded and headed out of the city around 9:45. After our long and exciting day in Chicago and miles of walking, I was ready to rest. And ready to be home again. I fell asleep before we left the city limits. Click here to see some more pictures from all around Chicago.